As one of the longest, continuously-marked footpaths in the world at 2,180 miles long, the Appalachian Trail runs from Springer Mountain, Georgia to Katahdin, Maine. Approximately 2-3 million hikers visit this popular trail each year, with about 2,000 attempting to "thru-hike" the entire trail. 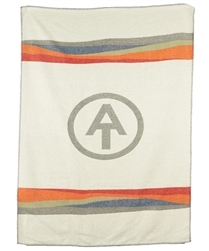 This Appalachian Trail blanket pays homage to the rugged souls who complete this 6-month journey with a soft wool jacquard weave blanket displaying the "A.T." trail marker. 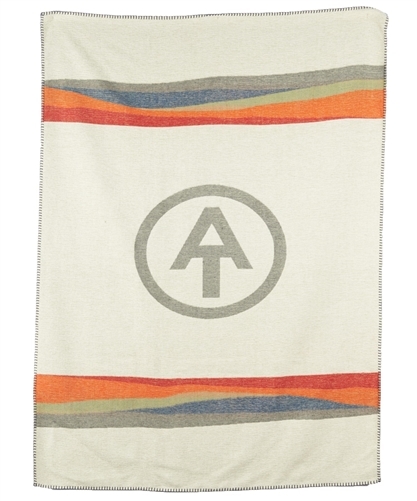 Whether you are looking for a warm blanket to keep you cozy through the winter or are looking for that perfect addition to your cabin decor, the Appalachian Trail Blanket by Wool Rich is the ultimate piece. For more options in cabin decor, look at the Wooden AT Wall Clock. Finishing: Crocheted, whip stitched edges.